Dennis Skinner MP, who has previously flicked the V-sign at Labour rebels and claimed to never have contemplated doing “cross-party stuff” shocked many as he voted against Jeremy Corbyn and Labour for the Repeal Bill on Monday night. He has also said in the past he refuses to be friends or work with Tories — so his vote may surprise those who count on him as a Jeremy Corbyn supporter. Mr Skinner, who is usually on the side of Jeremy Corbyn, voted for the Tory bill along with Ronnie Campbell, Frank Field, Kate Hoey, Kelvin Hopkins, John Mann, and Graham Stringer. 14 Labour MPs, including Caroline Flint, abstained on the bill. Corbyn supporters have said that MPs who voted against the whip should “find new jobs”. 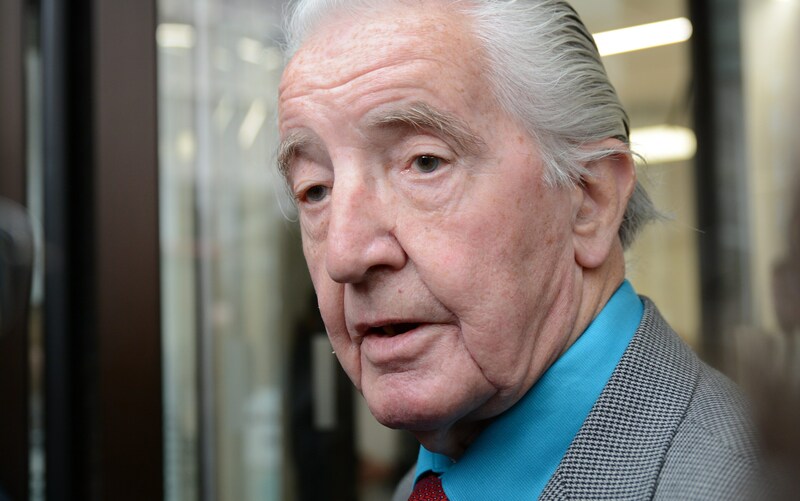 Dennis Skinner is the MP for Bolsover – which voted for Brexit by a large margin. 70.8 per cent voted Leave, while 29.2 per cent voted to Remain. He also was a staunch supporter of Brexit during the referendum, saying it was because he wanted to escape the capitalism of the EU and protect the future of the NHS. The Telegraph notes that Labour supporters have called for those who backed the Tory bill to be deselected, and asks if this applies to Skinner. The best the Telegraph could find to explain Skinner’s vote was an (unsourced) article in the Morning Star, from which this quote is taken. Here is the original, Morning Star, Friday 10th of June 2017. Speaking to the Morning Star yesterday, he confirmed he was backing a break with Brussels because he did not believe progressive reform of the EU could be achieved. He said: “My opposition from the very beginning has been on the lines that fighting capitalism state-by-state is hard enough. It’s even harder when you’re fighting it on the basis of eight states, 10 states and now 28. Even some on the pro-Brexit left argued against the Tory Repeal Bill. Counterfire published this: A very British coup: May’s power grab Josh Holmes September the 11th. If Theresa May carries off her coup, the Government will be given a majority on committees, even though it doesn’t have a majority in the House. This may sound merely technical and a little arcane, but it has the most serious consequences for democracy. It means that the Tories will win every single vote between now and the next election – which may well be in five years’ time. May says she needs these powers because, without them, it will be hard for her to pass the Brexit legislation. She is right: it will be hard, and the legislation probably won’t end up looking like what she wants. It will be subject to proper scrutiny, and Labour, the SNP and every other party in Parliamentwill have a real say in shaping its final form. Britain’s post-Brexit future will not be written by the Tory party alone. Skinner has many good points, and many weaknesses, which are well known in the labour movement. A film director has been given rare access to follow Dennis Skinner for two years to make a documentary. Daniel Draper, who has made Nature of the Beast, told Daily Politics presenter Jo Coburn it was “fair criticism” for some who claimed he was guilty of hero-worshipping the Bolsover MP. MT: Since the 1940s the world markets have been structured by a series of institutions: the WTO, the IMF, the G20, the G7, NATO. The USA has been central to all of these. Is Trump going to blow them up? AG: He hasn’t been tested by a major international crisis yet, but almost certainly there’ll be one during his presidency. How he will react is unclear: how much he will be guided by people like Mattis and McMaster and how much he’ll do something unpredictable. There is a risk it could be the latter. While he hasn’t done much that’s very radical yet, he has certainly disoriented the complex web of international alliances that the US has put so much store by over the last 70 years. He has upset Australia and Germany: very long-standing allies. He has given comfort to Russia and some other states which are normally not close to the US at all. This has been very unsettling for lots of other states. The likelihood is that that’s going to continue because of the erratic and chaotic way the Trump administration works. MT: The Economist (26/1/17) commented that Trump was bringing to political dealing his approach from business bombast and brokering: “he aims high, pushes and pushes, but then settles for less than he originally sought”. But, as the Economist comments, “dealing with countries is a higher-stakes game than bargaining over Manhattan building plots”. AG: I think it is partly that. He clearly had so little actual political experience. His business background was fairly low-level – real estate – he wasn’t CEO of a major international company or anything like that. Tillerson is a different category of a businessperson from Trump. Trump’s experience was as a reality TV host. That too has coloured how he has approached things. He approaches relations with other leaders with an eye on how it’s going to play with his base and how he can make himself look good. He uses bluff and does outrageous things partly in the belief that this will enhance his ability to do deals. This is in itself a very unsettling way of conducting relations. In the first six months he sent out more than a thousand tweets. These things are superficial in one way, but they betoken a style which is deeply unsettling: the fact that he is prepared to put things into tweets which normally, in previous presidencies, would have been private communications, the fact that he’s prepared to go public. I had wondered whether his behaviour might start to change as he learnt more about what the US Presidency was like. But it seems at the moment that this doesn’t seem to be happening. Every time his behaviour has become a bit more normal it has been followed by reverting to some of his old techniques and habits. I conclude that he probably isn’t going to learn very much and what we’ve seen in the first six months is likely to carry on. All US Presidents have had courts. But Trump’s court is particularly fluid and has some very opposed factions within it, which, in policy terms, point in quite different directions. Trump seems to pivot from one of these factions to another, so that no faction is dominant for very long, and he plays the factions off against one another. That makes the policy even more erratic and hard to read for foreign observers. Where this is all going is strange. We should expect some major shocks, and particularly if crises of one kind or another test Trump. MT: The Russia connection? What’s in it for Trump? And what’s in it for Russia? AG: It is mysterious how difficult it is for Trump to shake the Russia connection off. That has led me to believe that there is something going on which we don’t understand yet. The likely thing, although there isn’t firm evidence for this yet, is that Trump’s business empire is reliant in some way on Russian money – not government money, but oligarch money. There were stories at one time, of links through Deutsche Bank, which is one of the main funders of the Trump business empire. The multiple links of people associated with Trump with Russia are extraordinary. There is probably something of substance behind it all. He has also got people, particularly Mattis and McMaster, who represent the American political security establishment and a traditional US policy towards Russia, and that of course chimes with what a lot of Republicans want. The Phoenix John Brown Gun Club sent a ‘community defense contingent’ to a Make America Great Again rally at the Arizona state capitol, image via Redneck Revolt‘s website. A well-armed organization of anti-racists are using gun culture to organize rural white voters against the administration of President Donald Trump. The name harkens back to the 1921 “Battle of Blair Mountain” when some 10,000 United Mine Workers of America staged the largest labor uprising in US history, with many miners wearing red bandanas around their necks. Over one million rounds of ammunition were fired before President Warren Harding sent in federal troops. Over sixty people died in the battle and almost 1,000 miners were arrested. Such radical history is now being used to reach out to white working class voters. Guns culture provides the group with an organizing avenue. Redneck Revolt seeks to change the calculation. It’s pretty obvious that former FBI director James Comey was sacked because the FBI’s investigation of Russian government interference in the 2016 election was closing in on Trump. All other explanations – and in particular, that the cause was Comey’s handing of the Hillary Clinton email affair – are simply preposterous. Trump has denied any collusion: but he would, wouldn’t he? All the (admittedly, so far largely circumstantial) evidence points to Trump being either a traitor or Putin’s useful idiot. Putin has always denied attempting to influence the US presidential election: but he would, wouldn’t he? Albeit, with a smirk. Comey spoke in March at a rare open hearing of the congressional intelligence committee, which is also investigating the links between the Trump campaign and the Russian government. He said the investigation was “very complex” and he could not give the committee details that were not already publicly known. He also said he could not give a timetable for its completion. “We will follow the facts wherever they lead,” he said. Also testifying before the committee was National Security Agency (NSA) chief Admiral Mike Rogers. He said the NSA stood by an intelligence community report published in January, which said that Russian President Vladimir Putin had ordered a campaign to damage the presidential prospects of Hillary Clinton. In January, US intelligence agencies said Kremlin-backed hackers had broken into the email accounts of senior Democrats and released embarrassing ones in order to help Trump defeat Hillary Clinton. Since then, Trump has faced well-sourced allegations that his campaign team had links to Russian officials. Former Director of National Intelligence James Clapper has said he is in no doubt that the Russian government was behind the hacking of the Democratic Party during the election, but that at the time he left his post in January, he’d seen no evidence of collusion. However, Adam Schiff, the committee’s top Democrat, said the material he had seen offers circumstantial evidence that US citizens collaborated with Russians to influence the vote. If the Trump campaign were found to have colluded with Russia it would eclipse the Watergate scandal and be the most outrageous act of treason in US history. Two senior officials in the Trump administration have been caught up in the allegations – former national security adviser Michael Flynn, and Attorney-General Jeff Sessions, who was forced to recuse himself from any federal probe of Russian meddling in the presidential election, because of his contacts with the Russian ambassador to the US, but now – outrageously – turns out to have been heavily involved in the Comey sacking. Flynn was fired after he was exposed as having lied about his conversations with the Russian ambassador before he was appointed national security adviser. 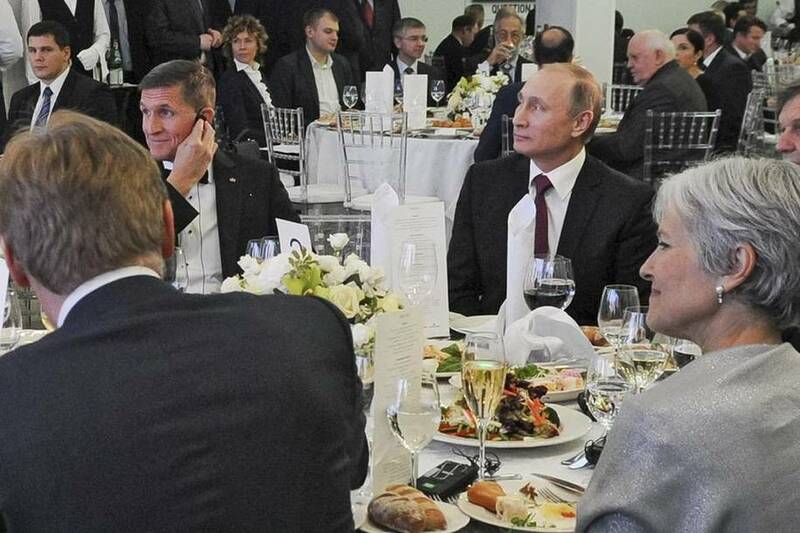 Flynn has a long history of close and friendly relations with the Putin regime, and has received payments from the regime’s propaganda channel RT. He lied about having discussed US sanctions with ambassador Sergei Kislyak. It is illegal for private citizens to conduct US diplomacy. Meanwhile, Sessions was accused by Democrats of lying under oath during his confirmation hearing in January, when he said he had “no communications with the Russians”: it later emerged that he had met Kislyak during the campaign. Sessions denied any wrongdoing, but removed (‘recused’) himself from the FBI inquiry into Russia’s interference in the election: now it transpires that he’s played a key role, at Trump’s behest, in getting rid of Comey. Trump could be heading for impeachment over his corruption and treacherous links to Russia. But, unlike even Nixon, Trump doesn’t play within the rules of bourgeois US politics. Trump is still very popular with his base. He can argue plausibly that he has tried using Executive Orders to do what he said he would do. Where these orders are being reversed by the courts or bureaucracy he will point to the key idea that the system is broken and dominated by a liberal elite. The Russian issue doesn’t currently impinge on his supporters’ admiration for him as they are in general isolationists. He’s on 80% approval ratings with Republican voters. Trump won’t go quietly and the ace up his sleeve is the movement behind him. It is a genuine mass movement, plebeian in character (often sole traders, shop keepers, small business owners, lumpen blue collar workers, the unemployed, farmers etc) and radical in the sense they don’t defer to authority. If he wanted he could probably mobilise enough of them to turn up outside the Capitol with guns and set up camp. There is a history of this kind of thing happening in the US at state level. The impeachment of Trump would in all likelihood enrage his mass base, fuelling ‘deep state’ conspiracy theories and resentment against bourgeois democracy: fertile ground for American fascism. That doesn’t mean that the left shouldn’t use the charge of treason and collaboration against Trump, or not campaign for his impeachment. Some on the left (and even the liberal-left) have recoiled against this, on grounds of supposed “McCarthyism” (a claim that Trump himself has raised): but that’s nonsense. 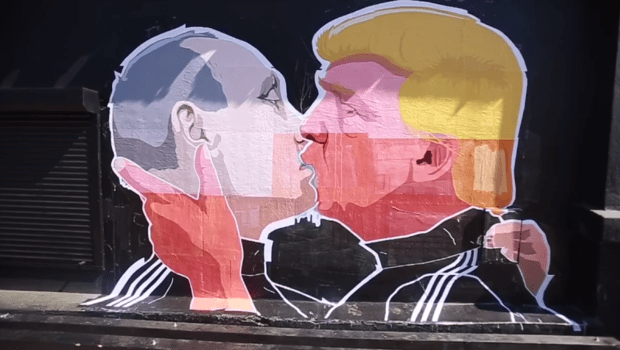 The suggestion of collusion with Putin is not comparable to the anti-communist witch-hunts of the 1950s and ’60’s: Putin is behind an ultra right wing international campaign to promote reaction, nationalism and isolationism wherever he can. He’s backed Brexit, Trump, Le Pen and a host of other ultra-right and semi-fascist movements. It’s not McCarthyism to denounce Trump for his links with Putin, up to and possibly including outright treason. But it’s not enough: the US left must also engage with Trump’s working class base and convince them that this billionaire racist, shyster and charlatan offers nothing worthwhile to American workers. The man who commanded the force responsible for, amongst other things, the death of the Queen’s cousin Lord Mountbatten, exchanged a handshake with the woman whose armed forces murdered 14 innocent civil rights marchers in his hometown of Derry. This was, all proportions guarded, a real life instance of David Low’s famous cartoon “Rendezvous” in which Hitler (“the bloody assassin of the workers”) greets Stalin as “the scum of the earth”. The response of the press, in Britain, Ireland and internationally, was very positive. The Guardian thought “it underlined how far we have come since the Troubles”. The Mirror contained an unusually calm and rational article from Tony Parsons who described it as “the end of something — the decades of hatred, loathing and bloodshed” as well as “the beginning of something, too — when the raw wounds of the past can perhaps begin to heal”. The Belfast Telegraph, traditionally a Unionist paper, hailed the handshake as “bridging a gulf that spanned centuries”. The southern Irish press was unreservedly impressed. The New York Times called it “a remarkable sign of reconciliation for both figures”. The working-class socialist response to this would seem to be fairly straightforward. McGuinness claims still to be a republican in both important senses of the word. As a “capital R” Republican he appeared to make peace with the highest symbol of British rule while her state and government continue to “occupy” the northern part of Ireland and deny his people self-determination. Even more objectionable is his apparent suspension of “lower case” republicanism — the rejection of rule by hereditary, unelected privilege. Contempt for such an institution should be taken for granted by even the mildest democrat. 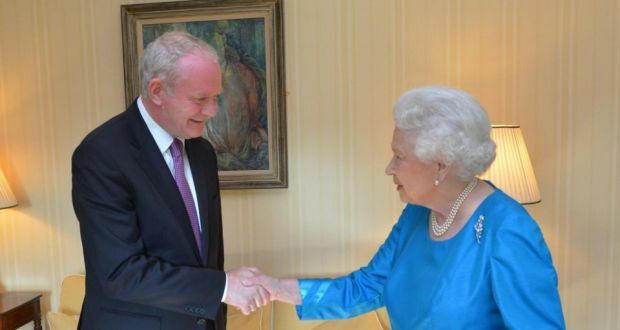 Didn’t McGuinness, by shaking the Queen’s hand, acknowledge both her right to rule and her government’s sway in Ireland? A glance at the fiercest critics of this historic handshake is a reminder that things are more complicated. Before the meeting the Daily Mail advised the Queen to burn her gloves after carrying out her “distasteful duty”. The Sun’s front page headline declared “We don’t blame you for wearing gloves M’am”. The Times cartoonist provided an image of the Queen putting on four pairs of gloves before shaking the bloodstained hand of McGuinness. The idea that there might be plenty of blood on the monarch’s hands too didn’t occur to any of them. The Daily Mail was the one paper that didn’t deem the occasion to be worth a front page story. Inside, though, they brought us arch-militarist Max Hastings under the headline “I’m sorry, even in the name of peace, it was wrong to shake his blood-soaked hand”. Hunting for evidence that McGuinness, the deputy prime minister and latter-day conciliator, remained “a fanatic”, Hastings alighted on his principled decision not to take his full ministerial salary (£71,000). For me, that is evidence that Sinn Fein retains some connection with its mainly working-class base. For Hastings, it shows “certitude about his own moral compass” and this, he claims, is “the foremost requirement of a fanatic”. On what appears to be the opposite side of the spectrum, McGuinness and Sinn Fein have been attacked by harder line Irish Republicans for yet another betrayal. Protests were held by dissident republicans, and senior SF councillor Alison Morris resigned in opposition to the event. It’s important to register clearly what the critics are opposed to. On the republican side it isn’t seriously claimed that McGuinness or his party have become soft on the monarchy. For certain McGuinness and Sinn Fein have rapidly acclimatised to being part of the establishment and clearly enjoy being normal bourgeois politicians. What took place on 27 June was, however, more than just a further shift down that road. The justification given by Sinn Fein had nothing to do with either the Queen or British rule. McGuinness described his move as “in a very pointed, deliberate and symbolic way offering the hand of friendship to unionists through the person of Queen Elizabeth for which many unionists have a deep affinity”. There is no reason not to take that rationale at face value. He went on to claim that this sort of symbolism had the potential to define “a new relationship between Britain and Ireland and between the Irish people themselves”. That view can be criticised as naive. It can be attacked as a top-down way of managing the communal differences without challenging the fundamental causes. In common with most elements of the “peace process” it seems to reinforce rather than undercut cultural division. It’s a different matter, however, to criticise it for “going too far” towards the unionists. The least bad fault with modern-day SF is that they are insufficiently intransigent nationalists. Yet that is the criticism most commonly levelled at them from the left. And it’s hard not to take some pleasure from the visible discomfort this event has caused to the British right. The fact that their Queen has felt it necessary to shake the hand of the former IRA commander has opened a very old sore for reactionaries. The sort of Tories whom Hitchens and Hastings write for spent their formative years insisting that those who took up arms to fight British rule anywhere in the world were no more than criminals. They said it too of Mandela and the ANC. Time and again they have seen these claims crumble to dust as the era of direct imperialist rule has given way to triumphant independence movements. And it hurts deeply. Hitchens’ adult life has been blighted by one episode after another of “humiliating surrender” by his “once-great country” to movements fighting to free their countries from colonial or racist rule (or “criminal gangs” as he prefers to put it). But the Irish people have not yet won a united independent state. The British have not surrendered and nor would it matter much if they did. The key to Irish territorial unity is, and has for decades been, democratic unity between its people. What Martin McGuinness did on 27 June offended the sensibilities of democrats and socialists because of our contempt for the institution of monarchy. However, his motive at least was progressive. It was also republican in the sense defined by the founder of modern Irish republicanism Wolfe Tone — “to replace the name Protestant, Catholic and Dissenter with the common name Irishman”. We should be bold enough to point that out. At last! The SWP have realised they should probably be calling for a Labour vote. However they reduce everything to Corbyn himself. They won’t support Labour in Scotland. The Socialist Workers Party has decided to suspend its membership of the Trade Unionist and Socialist Coalition (TUSC). TUSC has provided a structure for trade unionists, campaigners and socialists to stand in elections against pro-austerity politicians. It’s not a decision we take lightly. We have been part of TUSC for over seven years, stood dozens of candidates and recorded some of TUSC’s better results. We have worked with the other components of TUSC—the RMT union, the Socialist Party and independents. We think it is right to cooperate with others on the left wherever possible. Labour won’t be the vehicle for socialist transformation any more than Syriza was in Greece—and we still want a socialist alternative to it. But we cannot support the decision taken at TUSC’s recent conference to stand in May’s council elections in England and Wales. These elections will be seen as a referendum on Corbyn. It won’t matter if the candidates are right wingers. Every loss will be blamed on the left. For TUSC to stand at this point welds together Labour supporters and is a barrier to united front work with Labour people. Our small electoral united front would make it harder to achieve a larger united front with the Labour left. At the Copeland and Stoke by-elections Labour’s candidates were from the right. However, Socialist Worker called for a vote for Labour. We don’t want Ukip or the Tories winning. What’s at issue is how to fight cuts and work with Corbyn-supporting Labour members against those who ram though the attacks. And we know any victories for them would be used to unleash the dogs on Corbyn. We have been proven right. If TUSC was winning substantial votes the argument might be different, but the results will be modest. There’s no shame in that. But it makes standing against a Corbyn-led Labour even harder to justify. Our unwillingness to put forward candidates is not because Labour councils are doing a good job. They are ruthlessly imposing Tory cuts. Many councils face a loss of 60 percent of their income between 2010 and 2020. Yet there have been no Labour-led national marches, no councillors’ revolt, no calls for defiance by councillors, unions and people who use the services. Instead, at the last Labour conference, delegates and leadership united to declare it a disciplinary offence to pass “illegal” no cuts budgets. What’s at issue is how to fight these cuts and work with Corbyn-supporting Labour members against those who ram though the attacks. We believe the best way is to campaign in the streets and workplaces alongside Labour supporters. None of us can predict future events. At some point, as part of the fight to move beyond social democracy, we believe it will be necessary to stand in elections again. Were Corbyn to be removed and replaced by a right winger, the question of standing against Labour would return in sharper form. We hope TUSC will continue to be part of the response. In Scotland the situation is different. Labour is headed up by the anti-Corbyn Kezia Dugdale. The rise of the Scottish National Party has raised the question of alternatives to Labour. We support Scottish TUSC candidates as part of what we hope will be a wider realignment on the left. We wish the best to those who remain in TUSC and look forward to continuing to work with them. – Cites as one reason not to call for a vote for Labour in Scotland: the fact that Kezia Dugdale is anti-Corbyn (BUT, a majority of Scottish CLPs nominated Corbyn, not Smith. Most affiliated and registered supporters in Scotland probably voted Corbyn. Individual members in Scotland voted only narrowly for Smith rather than Corbyn. If members with less than six months membership had not been excluded from voting, a majority of individual members would probably also have voted Corbyn). – Cites as the second reason not to call for a Labour vote in Scotland, “The rise of the SNP has raised the question of alternatives to Labour” … (BUT, it could equally be argued that the rise of UKIP in England has raised the question of alternatives to Labour). – Demands a second referendum on Scottish independence (“We Need to Fight for New Referendum on Scottish Independence”). Current support for a second referendum: 51% against. 25% for. – In the real world, the pretext for a second referendum is that Scotland voted ‘Remain’ but England voted ‘Leave’. But the SWP, of course, called for a ‘Leave’ vote. The SWP wants a second referendum because Scotland voted the wrong way in the EU referendum? See also Tendance Coatesy, here. How credible are the allegations about Trump and Russia? On Tuesday evening, CNN reported unsubstantiated claims that Russian intelligence compiled a dossier on the president-elect during his visits to Moscow; BuzzFeed later published 35 pages of content from the alleged dossier. But Mr. Trump dismissed the developments as “fake news.” Judy Woodruff speaks with former NSA lawyer Susan Hennessey and former CIA officer John Sipher for analysis. JUDY WOODRUFF: Good evening. We are having some guests join me here at the “NewsHour” anchor desk in the coming weeks. Tonight, it’s Steve Inskeep, who many of you recognize from NPR’s “Morning Edition.” Welcome, Steve. STEVE INSKEEP: I’m delighted to be here. It’s an honor. Thank you. JUDY WOODRUFF: We’re so glad to have you. And we are devoting much of tonight’s program to our lead story, and that is the Donald Trump news conference today. It came amid a swirl of stories about the president-elect and Russia. DONALD TRUMP (recording): Its all fake news. It’s phony stuff. It didn’t happen. And it was gotten by opponents of ours. JUDY WOODRUFF: At his first news conference since the election, Donald Trump flatly denied the Russians have any compromising information on him. DONALD TRUMP (r): But it should never have been released, but I read what was released. And I think it’s a disgrace. I think it’s an absolute disgrace. JUDY WOODRUFF: The bombshell burst Tuesday evening, when CNN reported the president-elect and President Obama were briefed on the matter last week. The report included unsubstantiated claims that Russian intelligence compiled a dossier on Mr. Trump during visits to Moscow. The Web site BuzzFeed then published a 35-page cache of memos from the alleged dossier, including a claim of sexual activity caught on a Moscow hotel room surveillance camera. The New York Times and other major news organizations said they had been aware of the information for months, but could not verify the claims. Today, Mr. Trump insisted he wouldn’t put himself in such a position. DONALD TRUMP (r): I told many people, be careful, because you don’t want to see yourself on television. There are cameras all over the place, and, again, not just Russia, all over. Does anyone really believe that story? I’m also very much of a germaphobe, by the way, believe me. JUDY WOODRUFF: From there, the president-elect lit into the news media again. He condemned BuzzFeed. DONALD TRUMP (r): It’s a failing pile of garbage writing it. I think they’re going to suffer the consequences. JUDY WOODRUFF: And he accused CNN of being fake news, and brushed off persistent attempts by its correspondent to ask a question. Later, CNN’s parent company, Time Warner, defended its reporting, and BuzzFeed said it published what it called a newsworthy document. DONALD TRUMP (r): I think it was disgraceful, disgraceful that the intelligence agencies allowed any information that turned out to be so false and fake out. I think it’s a disgrace, and I say that. And that’s something that Nazi Germany would have done, and did do. JUDY WOODRUFF: On Russian hacking more broadly, the president-elect suggested an upside to the probing of Democratic Party computers and e-mails. DONALD TRUMP (r): The hacking is bad and it shouldn’t be done. But look at the things that were hacked. Look at what was learned from that hacking, that Hillary Clinton got the questions to the debate and didn’t report it? That’s a horrible thing. JUDY WOODRUFF: Likewise, he acknowledged the intelligence verdict that President Vladimir Putin ordered the hacking, but he didn’t leave it there. DONALD TRUMP (r): I think it was Russia, but I think we also get hacked by other countries and other people. JUDY WOODRUFF: And looking ahead, Mr. Trump suggested the hacking will not necessarily hinder future cooperation with Putin. DONALD TRUMP (r): If Putin likes Donald Trump, guess what, folks? That’s called an asset, not a liability. Now, Russia will have much greater respect for our country when I’m leading it than when other people have led it. You will see that. Russia will respect our country more. He shouldn’t have done it. I don’t believe he will be doing it more. JUDY WOODRUFF: There were also questions about the Trump Organization’s business ties to Russia, and he denied there are any. DONALD TRUMP (r): We could make deals in Russia very easily if we wanted to. I just don’t want to, because I think that would be a conflict. So I have no loans, no dealings and no current pending deals. JUDY WOODRUFF: Mr. Trump has not released tax returns to verify his claims, and he said again he won’t do so until a federal audit is finished. He also declined to say whether his associates or campaign staff had contact with Russian officials during the campaign. An ABC reporter tweeted later that the president-elect denied any such contact after the news conference ended. We take a closer look at Russia, the president-elect, and these latest revelations with former attorney at the National Security Agency Susan Hennessey. She is now a fellow at the Brookings Institution and is managing editor for the Web site Lawfare about the intersection of the law and national security. And John Sipher, he served almost 30 years at the CIA, both in the agency’s clandestine service and executive ranks. He was stationed in Moscow in the 1990s and he ran the CIA’s Russia program for three years. He’s now at CrossLead, a consulting firm. So let’s start, Susan Hennessey, but I just want to ask both of you in brief, what do you make of this report? SUSAN HENNESSEY, Former NSA Lawyer: Right. So, for the moment, the real story is the allegations themselves are unverified. They’re obviously quite salacious in nature. The real story is that the intelligence community thought it was appropriate to brief the president of the United States and the president-elect. That means that serious people are taking this seriously. That’s different than saying that the intelligence community believes the allegations or has substantiated them. But this is a matter that is not just simply a matter of fake news or something that we should disregard. It clearly passes some degree of preliminary credibility. JUDY WOODRUFF: John Sipher, your take? JOHN SIPHER, Former CIA Officer: I think the question is, is this real? And there are things on the positive side and the negative side on that. On the positive side, for those of us who have lived and worked and worked in Russia and against the Russians, it does feel right. It does feel like the kind of thing that Russians do. A lot of those details fit. Also, I think, the author has some credibility, which is on the positive side. JUDY WOODRUFF: This is the former British intelligence officer. JOHN SIPHER: That’s right. Yes. On the negative side, it really is hard to make a distinction if we don’t know who those sources are. He talks about his sources providing various information. In the CIA, before we would put out a report like that, an intelligence report, there could be, you know, hundreds of pages of information on that person’s access, on their suitability, on their personality. We don’t have that. And, secondly, the fact that a lot of this reporting is the presidential administration in Russia and the Kremlin is a little bit worrying, because, I mean, that’s essentially a hard nut to crack. And U.S. intelligence agencies have been trying to do that for years, and the fact that he has this much data about them does put it into question a little bit. JUDY WOODRUFF: Susan Hennessey, let’s talk about your organization, Lawfare. 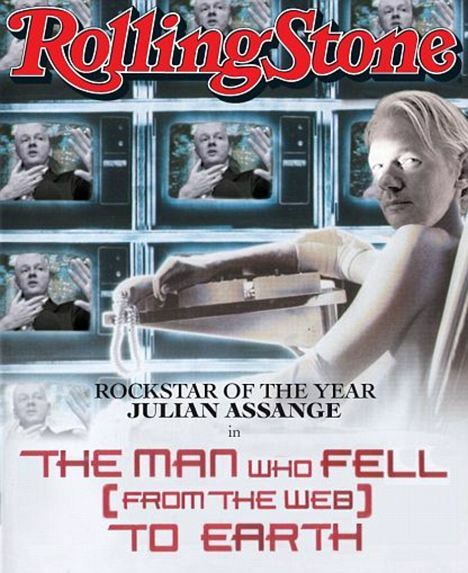 You had a copy of this, what, several weeks ago. And you started looking into it, decided not to put it out, but you did look into it. How did you go about figuring out or trying to figure out what’s real and what isn’t here? So, the document was shared with us to — so that we could provide some professional input as to whether or not it was credible. As we were satisfied that the relevant government entities were aware of the documents, and then like everybody else, we attempted to talk to people in various communities to see whether or not the allegations seemed credible to them. I think the point that we’re at now, it’s really not about our organization or anyone else verifying the specific facts. The FBI is conducting an investigation. We will expect — there are very specific allegations in this document. Those allegations can either be proven true or proven false. And so we should expect some answers that provide some additional clarity. One important note is just because a single fact in the document is true, it doesn’t mean the rest of the document is true. And just because a single fact in the document is false, that doesn’t mean the rest of the document is false. JUDY WOODRUFF: That the entire thing is false. Well, John Sipher, let’s go back to what you said a minute ago. You said there are parts of this that are credible, and you said it’s the way the Russians operate. What did you mean by that? JOHN SIPHER: It must look odd to views or anybody who has read this thing. It’s such a different world. But Russia is a police state. Russia has been a police state for much of its history. And this is the way they often do business. They collect blackmail on people. When I lived there, we had audio and video in our houses. We were followed all the time. Restaurants and places, hotels like this are — have video and audio in them. They collect this. They do psychological profiling of people to try to see who might be sources for them. This is just the way the Russians operate. So when you read this, it smacks of the kind of thing that we would believe is credible. That doesn’t mean it is. JOHN SIPHER: Right, the methods, right, and the — right. JUDY WOODRUFF: But you went on to say that the precise details in here are not borne out, are not verified by any individuals outside of this report, the British — the British office. And in that sense, it’s difficult because of the hyperpartisan atmosphere here. The fact that this is now in the public is going to spin up on the salacious details and these type of things, whereas I think the FBI does have a lot of experience doing very sensitive investigations like this, working with partners overseas and others to try to put this together, because there are a lot of details that we as citizens can’t follow up on. Did people travel during those certain days? Who are these people? And that’s the kind of stuff that we just can’t do, and the FBI can and will. JUDY WOODRUFF: For example, Susan Hennessey, there’s a reference in here to an attempt to get the FISA court, the court that has to OK investigations, surveillance of individuals, permission for them to look at four different people who were working for the Trump campaign, the Trump Organization. How unusual would something like that be? SUSAN HENNESSEY: So, certainly, it’s highly unusual in the context of a political campaign or a presidential election. That said, there is news reports that perhaps there were additional attempts to secure a FISA warrant, and that the FBI reportedly obtained one in October. If the allegations in the documents are true, are accurate, those are the kinds of things that would fall within FISA. That’s the type of warrant that the government would pursue. That said, just like everything else, we’re a step away from actually verifying the substance of that. John Sipher, if you’re in charge of the investigation to figure out what is and what isn’t right, if anything is accurate in here, what do you need to do now? JOHN SIPHER: What you need to do is take each piece of this document and run it to ground. So, you need to find out — they talk — the issue here is not the salacious details, the blackmail piece. The issue here is the criminal behavior if people in the Trump campaign were working with Russian intelligence to collect information on Americans. If that’s the case, there’s a lot of detail in there that needs to be verified. And we have to find out, did the people travel on the days they said they traveled, those type of things? So, there are a lot of things to run down that you can run down with your partners and information that you can collect as part of an investigation in U.S. travel records, all these type of things. JUDY WOODRUFF: Susan Hennessey, what would you add to that? If you were involved in trying to determine if any parts of this are accurate or to verify that they’re not accurate, how would do you that? So, certainly, the FBI is going to be calling on all of their resources to investigate the specific allegations, things like travel records, things like financial documents. They’re also going to need to draw on intelligence sources. And so there are specific sort of comments about meetings between Putin and others, very sort of high-level, high-value intelligence targets. They would really need to reach very deeply into their intelligence networks and the networks of allied intelligence agencies in order to see if anything to lend credibility or substantiate these very serious allegations. JUDY WOODRUFF: John Sipher, we saw that Senator John McCain had a role, the Republican senator, of course, from Arizona, had a role in this. How did he come into this, and does that tell us anything? JOHN SIPHER: Well, Senator McCain, obviously, has a lot of experience working with the government on sensitive things and has always been a hawk on Russia issues. And I’m supportive of that. I think he’s been good in that case. My understanding is the author of this himself provided information, this information to get to the FBI, through Mr. McCain, who got the information through the FBI. And, obviously, other news places had it. What’s interesting is President Trump, President-elect Trump seems to think that the intelligence agencies themselves leaked this information, whereas it doesn’t seem to me that that’s the case. The fact that you and others have had this for so long and actually held off on putting it suggests to me that this information has been out there for a while, and I think that’s why General Clapper and others briefed the president-elect on this last Friday. JUDY WOODRUFF: What would you add to that? SUSAN HENNESSEY: So, I think this is an incredibly important point. So, when President-elect Trump today seemed to suggest that he believes the intelligence community leaked this, saying it would be a blot if they had done so, there’s absolutely no indication that the intelligence community is the source of the documents. BuzzFeed, the organization that published this document, this is actually not even an intelligence community document. It is a private company. It’s not even classified material. And so a little bit, there is a suspicion that once again Donald Trump is using his personal attacks on the intelligence community a little bit to divert attention away from the substance of the allegations. JUDY WOODRUFF: Very quickly to both of you, how confident are you that we’re going to know eventually whether this is — whether any of this is accurate? JOHN SIPHER: I have confidence. Yes, I have confidence that the FBI is going to follow this through. My nervousness is that these kind of things are going to dribble and drabble out for the next several years and cause a real problem for this administration going forward. SUSAN HENNESSEY: Because this is so important to the credibility of the president, we would really want to see him establish some kind of independent commission or council in order to really get to the bottom of these facts and provide some reassurance to the American people, not only that this is being investigated, but also that President-elect Trump himself is taking this matter very seriously. JUDY WOODRUFF: Susan Hennessey, John Sipher, we thank you both.